Billie Jo Shaver Doughty, 90, of Ringgold went home to be with the Lord Monday February 11, 2019. She was a daughter of the late William Silas and Ruth Elizabeth Black Shaver. 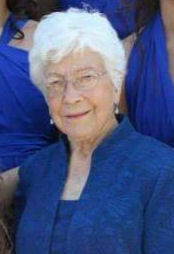 She was a lifelong resident of the Chattanooga, North Georgia area, and a member of Chattanooga Valley Baptist Church. Billie Jo loved the Lord and served many churches in the area with her late husband, Pastor, Rev. W.B. “Jerry” Doughty Jr. She was a true blessing to all who knew her, and had an immense love for her family and friends. Mrs. Doughty was also preceded in death by her four siblings and son-in-law Coach Larry Fleming. She is survived by daughter Debbie Fleming (Steve) Smith of Ringgold, grandchildren Melanie (Eddie) Blunt of Tishomingo, MS, Laura (Kevin) Teague of Ringgold, Chip (Melissa) Fleming of Swansboro, GA, great-grandchildren Ashton, Peyton, Micah, Megan, Lyndsey, Sara Beth, Ansley Grace, Caitlyn, and several nieces and nephews. Services will be held 1 PM Thursday in the funeral home chapel with Chip Fleming and Pastor Steve Smith officiating. Interment will be in Chattanooga National Cemetery. The family will receive friends 4-8 PM Wednesday at Heritage Funeral Home, Battlefield Parkway.